One Sunday afternoon we drove down to Tubac, a little town close to the Mexican border. It’s mainly for tourists and weekend shoppers. There are many artists that create pottery, iron sculptures, wood furniture, etc. and sell it to the visitors. The art work ranges from traditional over kitschy to cool and just crazy. Even though it’s a modern town, it still has an old West feel to it, including some of the buildings. Turns out there’s an ostrich farm about half an hour from our house. There’s lots of fun stuff to do. You can feed various critters, including ostriches, deer, goats, donkeys, and lorikeets. 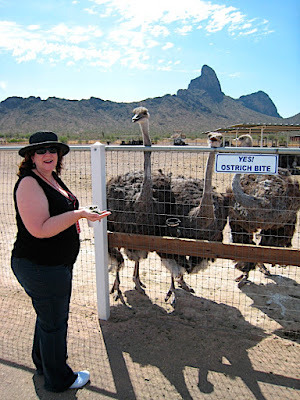 You can also go on a tour of the farm and surrounding desert in a tour bus turned monster truck driven by a crazy redneck chick, with a stop to do some ostrich fishin’. Fun way to spend an afternoon. Click here for many more larger photos. Here are a few more photos of critters encountered in Tucson, and some of them are not for the squeamish. 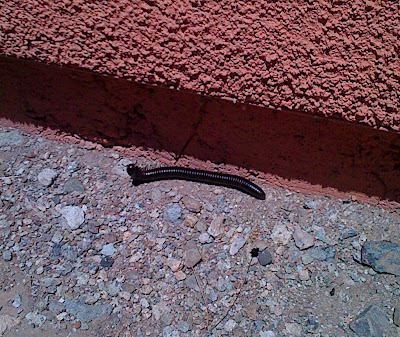 A millipede I found casing our garage. A tarantula we found on the side of our house one evening when we got home. I held a ruler next to it so you can get an idea of the size of this thing. Its leg span was at least 6 inches/15 centimeters. My buddy Thom, a home inspector, encountered this scorpion during an inspection and sent me this photo. His hand in the photo for scale helps demonstrate the size of this creature. Click here to see larger versions of the photos. Btw, if you’re wondering about the seemingly different wall colors of the first photos, they’re actually the same. One photo was taken in extremely bright daylight with an iPhone 3G, the other one was taken with a Canon SD800IS with flash while it was completely dark.